I've un-installed, and re- installed numerous times. please help!! ahh!! ooh that is a very bad virus. I'm afraid you can't play mine craft anymore. 'Button 1' is your left mouse key. You must have clicked it twice. Click on the 'Pick Block' one and thing push the scroll key. That will make you scroll through your items. If you then click on the 'Use Block' and then click the right mouse button, it will be all better. Click on the one you want to change and hit the key you want it to be. 1. Find a friend who has a PC and log in to your account. 3. Log out and log on to your Mac - you will see your buttons are still the screwed up version. Now, however, you can change them. So, if the problem was the "Use Block" function, clear that function (and you get the ???) 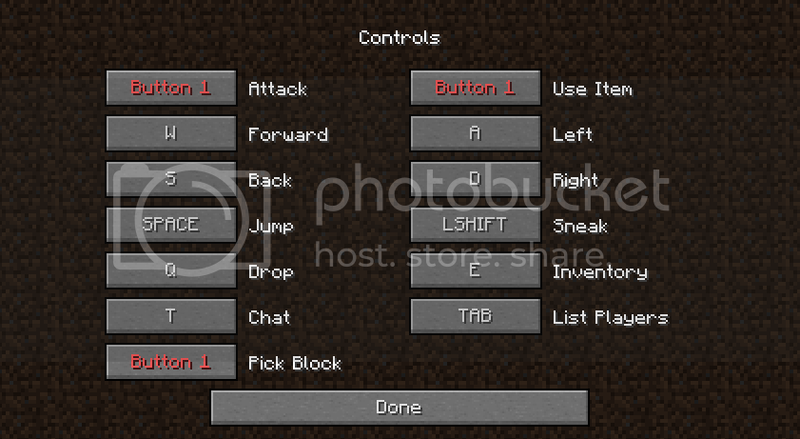 and then Control+click it and it should come up as Button 2. I hope that helps you or some future user like me who did not find much useful info out there. The posts above are really NOT helpful.